Rising rental costs accounted for almost 60 percent of the inflation reported for July. Rising rents are becoming an evermore important factor in inflation. The shelter component of the Consumer Price Index (CPI) rose 0.3 percent in July and accounted for almost 60 percent of the 0.2 percent inflation reported for the overall index in the month. The core index, which excludes food and energy, also rose 0.2 percent in July. Over the last year, the overall CPI has risen 2.9 percent. The core CPI has risen 2.4 percent, while a core index that excludes shelter has risen just 1.5 percent. 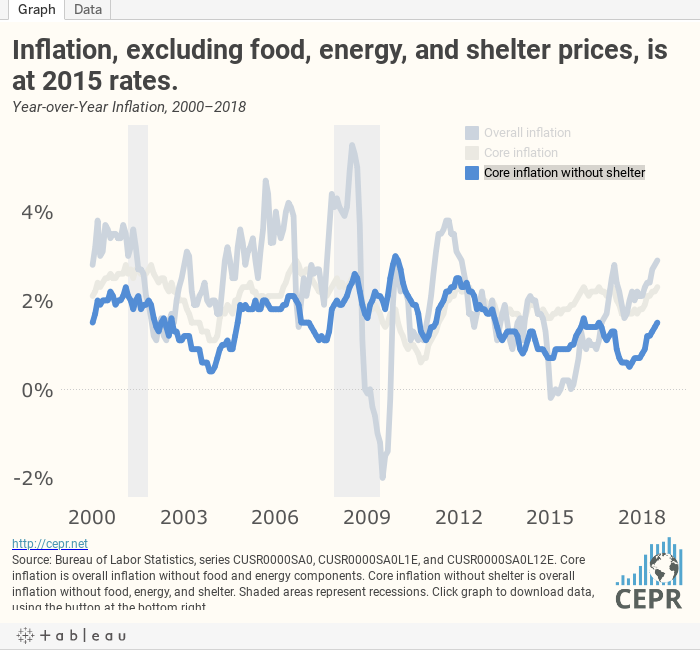 Outside of shelter, inflation in most components of the CPI was well contained. The medical care index actually fell by 0.2 percent, only its seventh monthly decline in the last 40 years. (All of the drops have been since 2013.) It has risen just 1.9 percent over the last year. The education index rose 0.3 percent in July. It has risen by 2.1 percent over the last 12 months. This was driven largely by a 0.5 percent jump in college tuition, which has risen 2.0 percent over the last year. New vehicle prices rose by 0.3 percent in July, their third consecutive monthly increase. They are now up 0.2 percent over the last year. Until this month, they had been falling on a year-over-year basis. The turnaround may at least partially be attributable to the tariffs on steel and aluminum. The annual rate of increase over the last three months compared to the prior three months was 1.6 percent. Used vehicle prices, which have almost two-thirds of the weight of new vehicle prices in the index, rose 1.3 percent in July. While the monthly movements are erratic, used vehicle prices tend to follow new vehicle prices. They are up 0.8 percent over the last year. Both rent proper and owners’ equivalent rent rose 0.3 percent in July. Over the last year they are up 3.5 percent and 3.4 percent, respectively. There is no evidence of any slowing in rental inflation as annualized rates over the last three months compared with the prior three in the two indices are 3.7 percent and 3.4 percent, respectively. With construction trending slightly downward in the last year, there is little hope that increased supply will alleviate the shortages driving rent increases. Auto insurance prices rose 0.2 percent in July, bringing the increase over the last year to 7.4 percent. It appears that inflation in this component is moderating. The annualized rate comparing the last three months to the prior three is just 2.5 percent. Given the importance of insurance to overall inflation in the last few years, continued moderation of price hikes will have a substantial dampening effect in the months ahead. Airline fares jumped 2.7 percent in July. This is most likely an anomaly, as prices are still down by 4.1 percent over the last year. Apparel prices fell 0.3 percent in July. They are up 0.3 percent over the last year. Inflation is likely to remain close to zero in apparel, assuming that the sector is not affected by tariffs. Energy prices fell 0.5 percent in July after falling 0.3 percent in June. They are still up 12.1 percent for the last year, but the increase in this index will be much more in line with the overall CPI after big jumps from last August and September drop out of the 12-month window. Assuming that world energy prices remain stable, the overall inflation rate will drop toward 2.0 percent in the second half of 2018. Rising rents remain the source of inflation. This is driven by shortages of housing in desirable markets. Unfortunately, the downward trend in housing construction means that these shortages are unlikely to be addressed on the supply side in the foreseeable future. The other inflation risk is higher prices in areas such as washing machines and cars, where tariffs are raising costs. Excluding these factors, there is no evidence of inflation becoming a problem elsewhere. Inflation in the core index excluding rent remains well below the Federal Reserve Board’s 2.0 percent target.